Reading and share top 33 famous quotes and sayings about Presley by famous authors and people. 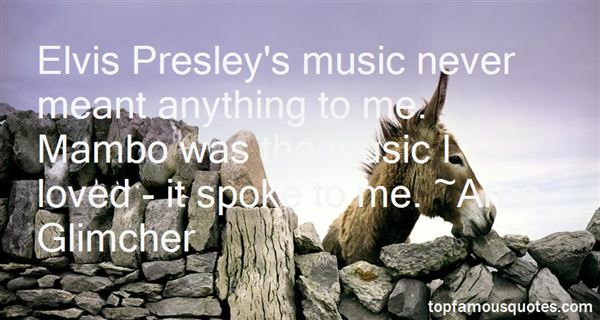 Browse top 33 famous quotes and sayings about Presley by most favorite authors. 1. "I came close to signing Elvis Presley. I offered $25,000 for his contract and they asked for $45,000 and I just didn't have the other $20,000." 2. "Elvis Presley's music never meant anything to me. Mambo was the music I loved - it spoke to me." 3. "I saw an Elvis Presley movie Jailhouse Rock, where he gets out of jail and makes his own records and takes them to the radio stations himself. And then, he puts records in the store. After seeing that, I made records an put them in stores." 4. "Elvis's Twin SisterIn the convent, y'all,I tend the gardens,watch things grow,pray for the immortal soulof rock 'n' roll.They call meSister Presley here,The Reverend Motherdigs the way I move my hipsjust like my brother.Gregorian chantdrifts out across the herbsPascha nostrum immolatus est...I wear a simple habit,darkish hues,a wimple with a novice-sewnlace band, a rosary,a chain of keys,a pair of good and sturdyblue suede shoes.I think of itas Graceland here,a land of grace.It puts my trademark slow lopsided smileback on my face.Lawdy.I'm alive and well.Long time since I walkeddown Lonely Streettowards Heartbreak Hotel." 5. "Charles Simic, when asked what he thought of Slam Poetry events: "They are fun, but they have as much to do with poetry as Elvis Presley had to do with Charlie Parker and Thelonious Monk"." 6. "Up until the mid-eighties, there was always a shared assumption that the Right controlled the currency of outrage; part of what made conservatives "conservative" was their discomfort with profanity and indecency and Elvis Presley's hips. But then?—?somewhat swiftly, and somehow academically?—?it felt as if the Left was suddenly dictating what was acceptable to be infuriated over (and always for ideological motives, which is why the modifier "politically" felt essential). This created a lot of low-level anxiety whenever people argued in public." 7. "Be ye innocent as doves yet wise as serphants" new testament quoted by Elvis Presley and applied to karate"
8. "I guess I thought I was Elvis Presley but I'll tell ya something. All Elvis did was stand on a stage and play a guitar. He never fell off on that pavement at no 80 mph." 9. "I like visual images and there are certainly other bands that have strong visual images going all the way back to Elvis Presley, but it's kind of like that's never really been my bag. Probably because I'm too shy." 10. "I know I'm not going to sing like Aretha Franklin or Elvis Presley or any of those people." 11. "For a moment she could have sworn she was standing in one of those history-comes-alive museums--the kind that feature animatronic robots, the narration stylings of James Earl Jones, and the sort of exhibits that invade children's nightmares for years to come. But instead of a cyborgish John Wilkes Booth discharging his deadly bullet into the back of a plastic Lincoln's head, a very real version of the assassin was engaged in a furious arm-wrestling match with Elvis Presley.Lincoln was watching the tussle, amused. "Come on, John," he said. "You can do better than that. ""He's all talk," Elvis whispered back."Silence!" roared Booth. "I'm trying to concentrate! "Lincoln rolled his eyes." 12. "Elvis Presley, The Everly Brothers, and a lot of American artists were my greatest influences." 13. "(Dominic after winning King & Queen contest at Prom along with Tess) "You like me, you really like me!" he said in a mock high-pitched voice, channeling his inner Sally Fields. "First of all, I have to thank my first grade teacher, what was her name? Mrs. Johnson? Nichols? Jameson? Prescott? Yeah, that was it. Man, I had such a crush on her. Even at five, I had awesome taste in women—just look at Tess. Isn't she banging? Anyway, I need to thank Mrs. Pentecostal, because she told me I'd never win anything, and that hurt, man. But I guess I showed her. So take that, Mrs. Presley!" 14. 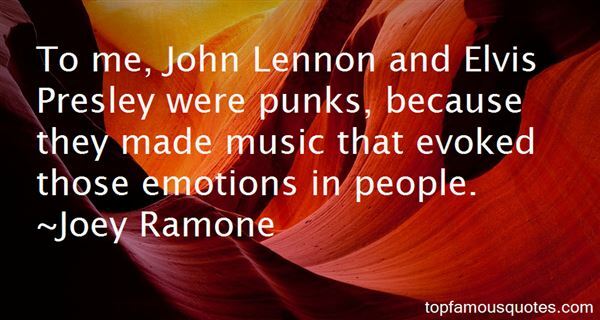 "To me, John Lennon and Elvis Presley were punks, because they made music that evoked those emotions in people." 15. "But I still do believe that there are useful things to say about Elvis Presley, including what his own ordinariness as a poor Southerner says about 20th-century hero-making." 16. "Yet she lays out this family plan the way you'd say, "After yoga, I'll go to Lia's for the mani-special and then wax on about hairstyles and hemlines until dinner. "If I were gifted at making long-term plans, which by now we all know I'm not, and if I was at all hopeful, which we all know that I can never be, although it crosses my mind that it's entirely possible these are all just huge, f*&king, temporary setbacks and nothing more, even though it's been going on for over three years now, since Holly died, and I met Lincoln Presley. Events that could be construed as somehow inevitably related. Yes, perhaps there's an expiration date on the said pursuit of unhappiness. Perhaps, things will eventually go my way after I actually discover what that way is supposed to be." 17. "Rocket Fever Grips Nation's Teenagers' cheers on enthusiastic newsreel, reflecting the nation's sudden reversal in attitude following the successful launch of Explorer-I into Earth orbit. Rather than being strange and threatening, outer space looks set to become the next big distraction after Elvis Presley and Davy Crockett hats. 'More and more teenagers are passing up rock and roll for a rocket role,' commentator Michael Fitzmaurice blithely remarks before very probably wishing he hadn't." 18. "Dad says that Elvis Presley lived in Memphis and was a musician (not that you would know that from the crap songs that Dad sings). Anyway, he was a musician and Masimo is a musician, ergo Memphis must be somewhere that musicians hang out." 19. "It's pretty amazing to me that my first hit record was an Elvis Presley record." 20. 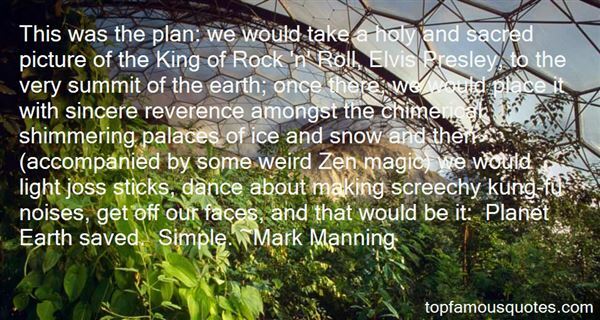 "This was the plan: we would take a holy and sacred picture of the King of Rock ‘n' Roll, Elvis Presley, to the very summit of the earth; once there, we would place it with sincere reverence amongst the chimerical shimmering palaces of ice and snow and then (accompanied by some weird Zen magic) we would light joss sticks, dance about making screechy kung-fu noises, get off our faces, and that would be it: Planet Earth saved. Simple." 21. "Constipation ran Presley's life. Even his famous motto TCB—? 'Taking Care of Business'—?sounds like a reference to bathroom matters." 22. "Elvis Presley once said that I don't know anything about the music. It is because he is the music itself! The nightingales don't know anything about the music!" 23. "A typical National World Weekly would tell the world how Jesus' face was seen on a Big Mac bun bought by someone from Des Moines, with an artist's impression of the bun; how Elvis Presley was recently sighted working in a Burger Lord in Des Moines; how listening to Elvis records cured a Des Moines housewife's cancer; how the spate of werewolves infesting the Midwest are the offspring of noble pioneer women raped by Bigfoot; and that Elvis was taken by Space Aliens in 1976 because he was too good for this world. Remarkably, one of these stories is indeed true." 24. "And if there's any hope for America, it lies in a revolution, and if there's any hope for a revolution in America, it lies in getting Elvis Presley to become Che Guevara." 25. "The fact is Jerry Weintraub, the handsome, bearish movie producer, the man with the long career, who worked with Arthur Godfrey and Elvis Presley and Frank Sinatra and George Clooney, is a great storyteller - he's this as much as he's anything else. He takes time telling stories, too." 26. "I remember the revelation it was to me when I realized I'd rather be smart in the way Elvis Presley was than in the way, say, Ludwig Wittgenstein was. The thing was, you could imagine you could be smart like Wittgenstein by just thinking hard enough, but Elvis just had it. It was almost spiritual. A kind of grace." 27. "This is Graceland. Home of the most famous musician in the world. ""Michael Jackson lived here? ""No, dummy," Carter said. "Elvis Presley." 28. "Especially with four insanely angry, sword-carrying pirates bearing down on you, followed closely by an alien with a genetic malfunction that posed like Elvis Presley and looked slightly like a cross between a koala and a cuddly dog." 29. "I love singing some Johnny Cash, which is interesting because it's in a guy's key; I love singing Elvis Presley." 30. "Mrs. Porter was from Virginia and had a smooth-as-cat-fur way of speaking. She taught me how to say, "Fiddle-Dee-Dee," just like Scarlett O'Hara and she made her split-pea soup with bacon and even let me try on her lipstick sometimes as she teased up my hair in the same sixties style she wore, "Ala Pricilla Presley," whoever that was." 31. "No one likes to be typecast or stereotyped, especially actors. But who would know Esther Williams without a swimming pool, Bela Lugosi without a cape, or Elvis Presley without his guitar. Would we even care?" 32. "Woss the matter with you?" asked Big Ted, irritably. "Go on. Press ‘D.' Elvis Presley died in 1976. "I DON'T CARE WHAT IT SAYS, said the tall biker in the helmet, I NEVER LAID A FINGER ON HIM." 33. "And if I was Lisa Marie Presley and I'd told you I was going to marry Michael Jackson because I liked the shape of his nose, or rather, noses, and he's just a sweet boy who loves children, I mean really loves children, and his dramatic change in appearance was undoubtedly a result of a genuine bona fide skin disease, would you have said anything?" Potassium cyanide," says the talent wrangler as she leans over to pick up a paper napkin off the floor. "Found naturally in the cassava or manioc roots native to Africa, used to tint architectural blueprints in the form of the deep-blue pigment known as Prussian blue. Hence the shade 'cyan' blue."